TO MEET the specific long-term requirements of the planned Bapco Modernisation Programme (BMP), a major organisation-wide restructuring of divisions and departments was undertaken in 2014, with the aim of improving efficiencies and the provision of key services. A reorganisation of the company’s human resources, learning and development and administrative functions - implemented in conjunction with an external consultancy - is central to this project, as the organisation’s goal to mould a world-class workforce equipped to handle current and future business challenges, including the demands of the BMP, took significant steps forward in 2014. As in previous years, a key focus was on the development of leadership skills and technical expertise, while the structure of the security department was reorganised and several initiatives implemented to enhance Bapco’s physical security, productivity and safety to better protect existing assets. 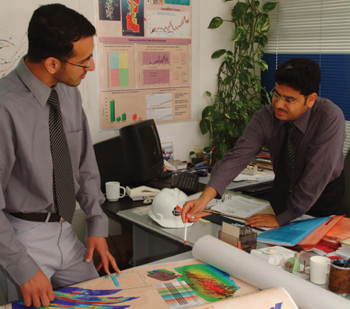 The company’s Performance Management Process (PMP), a ‘top-down’ approach first introduced in 2013 whereby general managers, managers, superintendents and supervisors cascade their objectives to their direct reports so that all employees are aligned with corporate goals, progressed into its second year with positive results. The PMP is applied extensively in various industrial enterprises worldwide to establish a unified system in the measurement and evaluation of employee development and performance, as well as to honour outstanding leaders, and in Bapco’s case in 2014 it helped shape and collectively influence the company’s annual productivity. Training was, as usual, an integral feature of the year. For example, a total of 21 management staff attended a ‘Lean Sigma’ familiarisation workshop, conducted by an external consultancy to help the company find ways to minimise waste, rationalise costs and enhance the efficiency of key Bapco processes. To address future management talent and skills needs, the company’s Bapco executive development programme made further strides in the year. Links with the prestigious London Business School were maintained, with a number of senior employees undertaking advanced management courses. Similarly, a select number of employees identified as potential future leaders were selected to participate in the Chevron Future Leader Track Training (CFLTT) programme, focusing on areas such as decision analysis, operational excellence management systems and strategic planning. Meanwhile, the company’s ties to the prestigious Institute of Leadership and Management (ILM) was strengthened as 33 employees successfully completed Level 2 and 23 candidates completed Level 3 of the ILM’s blended learning approach to executive development. Additionally, the Bapco Scholars Enhanced Learning Programme (BASEL), which helps the children of company employees solve actual workplace challenges, successfully completed its fifth year. Bapco also helped polish the skills of qualified industrial workers in the kingdom by providing dedicated training. Furthermore, the company is proudly committed to offering a wide range of scholarships to outstanding Bahraini students, supporting their higher education at leading overseas institutions. This included sponsorship of education for 59 children of Bapco employees at top institutions around the world. In addition, university education for nine outstanding students was sponsored, with six studying overseas and three in Bahrain.